In one of the alcoves in our living room, to the left of the chimney breast, we decided to fit some shelves to make the most of the height of the room and use it for some storage. At the bottom of the alcove, there was already a solid, built-in cupboard which houses the gas and electric meters, which was fine except that it was painted a weird yellow-y beige colour gloss. There was also a newspaper from 1998 and an empty beer can in there, so goodness knows what the previous owners had also been using this cupboard for?! People are strange. We wanted the shelves to be really simple and, knowing the range in sizes of our books – from the regular paperbacks, to the huge music books of my Husband’s and my giant Metric Handbook from my Uni days (which I will never read again, but it was so expensive to buy, I refuse to get rid of) – we wanted the spaces in between the shelves to vary, so there would be room for everything and it would look truly bespoke. At the time, the room was just painted white, which was what we did after all the rooms had been damp-proofed, just in case anything went wrong so we hadn’t spent a tonne on fancy paint just to have to hack it off again. In this room, I actually chose a colour that I had been considering for the dining room, but after I decided it looked too green in there, I moved my painted bit of paper into this room, and it looked great! The walls are Dulux Pebble Shore and it looks different in every type of light – sometimes a really light pale grey, sometimes quite a warm stone-y colour. Just what I wanted. To make the alcove look a bit more interesting, and to make the colours of the books really stand out, I decided to paint the back of the alcove a dark grey – Valspar Toy Soldier. I did an excellent piece of mental arithmetic and calculated that I’d be able to do the whole alcove in two coats only using 4 of their little sample pots which are usually around £3 each, but were on offer for £1 each! Cheap as chips! It only took 1.5 pots. For the shelves, we used some 5mm thick hard board, which we cut to the right size using a jigsaw. Just to make this a bit more interesting, our little house is anything but square, so the top and bottom of each shelf were actually all different dimensions! Cutting with the jigsaw made quite rough edges, so I also spent quite a while sanding the edges down, but it’s an easy material to sand so not too bad. We also had to make a little cut out at the back left of each shelf to allow the pipe to run behind. Our dining room floor was covered in these rectangles of hard board while I painted them with 2 coats of undercoat and 1 coat of gloss, both Brilliant White, and waited for them to dry. Once dry, we nailed the glossed hardboard onto the top and bottom sides of the batons, so there is no visible support to the shelves. Once the tops and bottoms were on, we fitted lengths of 6cm stripwood to the fronts, again, glossed white. All I had to do then is caulk around the edges to tidy up the join between shelf and wall, which I did extremely neatly, to save having to do any more painting, with the help of a lot of Frog Tape (my new favourite thing). My products of choice – Ronseal undercoat (usually needs 2 coats, but is really easy to apply and dries super fast) 2.5L is £23. Crown Pure Brilliant White Gloss (I have used this on all the woodwork in the house and it does it all in one coat, so long as your undercoat is solid) 2.5L is £23. 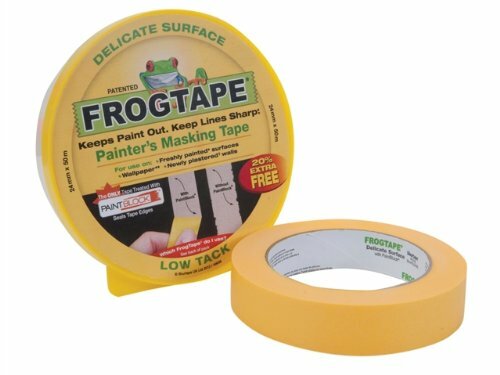 Frog Tape delicate surfaces masking tape, 40m roll, £4.50. The pretty little door knobs were from Homesense and were £5.00 for 4 – a friend and I both fancied the same ones so she has the other two in her house! The pot on the bottom shelf is a Bluebellgrey utensil pot which I snagged from a charity shop for £2.99 (I spotted it from the window of my bus to work and grabbed it on my way home – it usually retails for £27.00). The “All you need is love” hanging sign was a gift and I think by East of India. All in all, this project took 3 days, and cost us about £50 at the time, but a lot of the materials went on to be used for other jobs, so really not even that much! I love the look that books give to a room, they immediately make it feel lived in and homely. To the amusement of Husband, I did take quite a while to arrange the books and photo albums into a nice display, that I think looks much more interesting than just stacking them as per usual, but I think it was time well spent! This entry was posted in Our House and tagged alcove shelving, black mortar, books, crown, display, DIY, dulux, first home, First time buyers, frogtape, interior design, living room, ronseal, valspar, weekend project. Bookmark the permalink.